At a time of rising concerns about the future of democracy around the world, foreign policy experts on opposite sides of the Atlantic have markedly different assessments of the way democracy is working in their countries, with Americans holding a bearish view and their European counterparts more upbeat. Fewer than three-in-ten American foreign policy experts (27%) say they are satisfied with the state of democracy in the United States. By contrast, 64% of European thought leaders are satisfied with how their democracy is functioning. These assessments come from a recent canvass of attendees at the German Marshall Fund’s annual Brussels Forum and of alumni of various GMF fellowship and educational programs. Respondents included 237 Europeans and 110 Americans. American foreign policy experts are also more pessimistic than their European counterparts when it comes to trust in their country’s national government. About four-in-ten U.S. experts (42%) say they trust their government to do what is right for the country. Among European foreign policy thought leaders, the share who say this is 19 percentage points higher (61%). 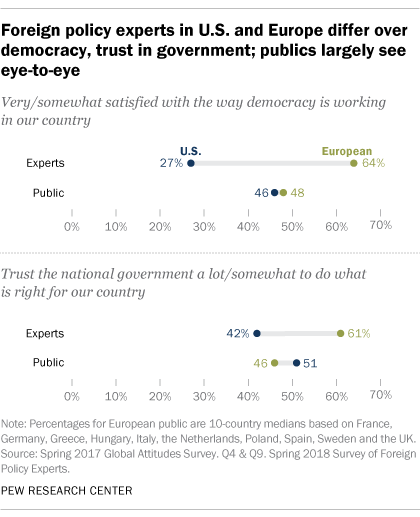 Notably, the U.S. and European publics are much more aligned when it comes to being satisfied with democracy and trusting their national government. 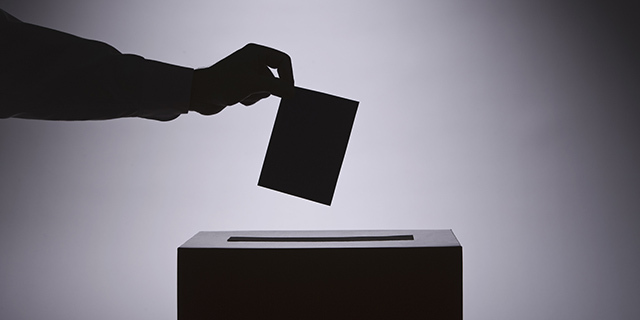 In the U.S., 46% of adults are at least somewhat satisfied with the way democracy is working in the country while 51% voice dissatisfaction, according to a spring 2017 Pew Research Center survey. Across 10 European Union nations, a median of 48% are satisfied with how democracy is working and 50% are dissatisfied. Levels of satisfaction vary widely between nations, ranging from 79% in Sweden and 77% in the Netherlands who are pleased with their democracy to just 21% of Greeks and 25% of Spaniards. In Europe, a median of 46% trust their government, while a median of 52% distrust it. There is again a divergence of views across nations: 71% of the Dutch voice trust their government, as do 69% of Germans, but only 13% of Greeks agree. Bruce Stokes is director of global economic attitudes at Pew Research Center.